- No. No. No! No buy shoes. Eye keem. Stated my emphatic toddler. Elementary school open house tonight. School starts Wednesday. My little princess will be a kindergartner. That's a whole other post... My big boy goes to third grade. I'm feeling old now. That's another post too... So, Melanie had floated the idea on the way there, "Anyone want to get ice cream after we go to school?" You can guess the response. School was filled with people. Friends. Neighbors. Teachers. The new year ahead like the new kindergarten wing with everything bright, shiny & smelling of paint & clean carpet. There was some tugging of parents down the hall. Some calling of kids back to the family fold through the crowd. Yet, surprisingly no begging for ice cream. Back in the car. One family member had his face firmly set. - You guys wanna go to Zesto? Mama asks. - No Zehtoh. Eye keem. - John Mark, Zesto is where we get the ice cream. - No Zehtoh, Mama. Eye keem! - John Mark, we go to Zesto to get ice cream. - Eye keem. Ah wahn eye keem. No Zehtoh. 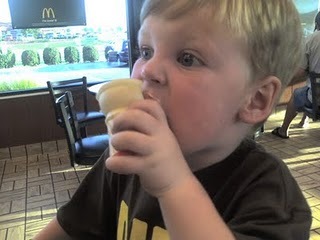 - Okay, John Mark, we'll get ice cream. Satisfied with no mention of Zesto & only ice cream we motored along talking about other things. Until. Melanie noticed a good, old - stress old, folks - pair of shoes she was wearing had an all the sudden hole in the long faithful leather. I said, "We gotta go buy Mama a new pair of shoes." You've already read the response that received. - No. No. No! No buy shoes. Eye keem. John Mark wanted to hear nothing but eye keem. Talk nothing but eye keem. Go nowhere but eye keem. He was not ugly or pitching a fit. He was kindly insistent with precious pronunciation. I had to wonder. Even though I know that I can not change God's mind. He desires my faith. He is loving. He will give good gifts so much more. He answers my persistence. Can I pray? Can I act? Can I be as single-minded & persistent as my young son? About things that really matter? About following Jesus? Loving my family? Serving my church? Zesto was closed. Broken machine sign said. McDonald's for eye keem.